D for Dog: The Story of a Ranger Company by Alfred E. Baer Jr.
By Alfred E. Baer Jr.
"Yes, it was going to be the real thing; it runs easy to see that, just from the maps. What you couldn't see was the gaunt skeleton that our company would lie when the two days and nights on Hill 400 were finished. You had no way of knowing ..."
The trucks ground to a halt near Kleinhau, a small clump of shattered farmhouses silhouetted beside the muddy road. The three officers and sixty-two enlisted men of Dog Company dismounted and stretched their cramped legs. They stood in the slow rain waiting for the march to begin, saying little and wondering miserably what lay ahead. Mixed with the rain was snow and sleet. The wind picked up the icy mixture and flung it into their faces, and even up under their steel helmets. Soon the move-out order was relayed down, and the column started off along both sides of the road, with the men staggered at no less than ten-yard interval; for they were going again into that other land, that land of screaming shells. In the cold, wet darkness, every man had an almost overwhelming desire to close up the interval between him and the man ahead—you want to be near someone when you are in danger—but carefully resisted the impulse. Often he threw a quick glance over his shoulder to be sure the man behind him had not lost contact; if the man behind was too close, he growled, (but softly) "For Christ's sake, keep it spread out! The instinct is to be near someone, but training and battle experience had taught the Rangers that the greater the distance between men, the fewer deaths there would be. And so the interval was maintained. 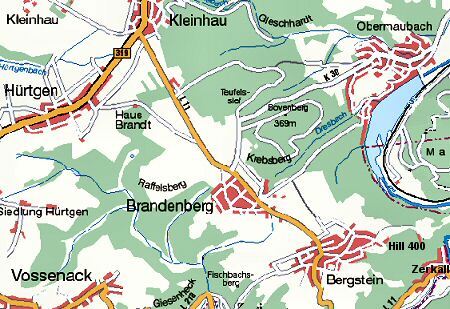 On the map, the distance from Kleinhau to Bergstein is not far. It is a mile or so that could easily be covered in an hour's time, even with rain-soaked overcoats, and packs, and bed-rolls, and weapons. It was a different story, though, with the halts, the absolutely unaccountable delays during which the men stood for long minutes waiting for the march to be resumed; stood bending over beside the edge of the road to relieve their aching backs. The standing still was always the hardest part of the march. When they were marching, they did not feel in as much danger, somehow, from the artillery—which was now beginning to land uncomfortably close. Standing still, there was a feeling that they were inviting disaster. It went on, at a snail's pace. The column would advance a hundred yards, or two hundred, and then stop for five minutes. They did not dare to take refuge in the roadside ditches now, for they had passed Brandenburg and were approaching Bergstein. The ditches here were almost certain to be mined. The town was faintly visible ahead. The men of the Company could make out the dim, slightly rectangular masses of blacker blackness that had come to mean destroyed buildings. Somewhere in the village a house was burning. No flames shot up brightly and dramatically against the horizon; there was, rather, a fierce, steady glow, red and menacing. The column stopped once more. Dog Company watched the glare, and looked around. It was two o'clock in the morning of December 7, 1944. "Since D-Day we have seen hundreds and hundreds of dead men. We have seen them floating, all purple and green, in the Channel. We have seen them on Pointe du Hoc, swelling in the hot sun. We have seen them along the road to Isigny, and on battlefields and in ditches all the way across France and into Germany. We have seen a few tonight, too, and will see more before the gray dawn comes. We have seen so many dead men that we have become indifferent to the sight of them. But these dim shapes along the road and in the fields on both sides of us now are horrible. They are not dead men. They are dead tanks. Dead American tanks. There is something weird and heart-breaking in the sight of them. They fill you with an absolute horror you have never experienced before, these shattered steel hulks ..."
The Company could understand now something of the intensity and fierceness of the battle that had raged here. In the town it probably would be worse. The men remembered what they had been told in the Forest, while they were waiting to move out. The battle for Bergstein and Hill 400 had been going on for almost a week. Three of our tank battalions had been practically wiped out in the fight, and the small village was still only half won. Hill 400 commanded the terrain for miles around, and was vitally important. The hill, and the rest of the town, must be taken. There was Ranger work to be done here, and they wondered, with a little chill of apprehension, if maybe the job wasn't too big for such a small outfit. After all, if so many men, driving so many tanks had failed, what could a handful of Rangers do? The best chance of success would lie in speed and surprise—as it always had before. The Germans would try every trick in their fat book of warfare to turn the Rangers back, and to keep the town clear of the hated Yankees. They stood there on the road, thinking, perhaps, of Pointe du Hoc, and Hill 63, and the job that lay before them. They stood beside the dead tanks, and took refuge beneath them from the mortar shells which were dropping in more frequently now, and dangerously close. The minutes passed, and became hours. The rain and snow and sleet tapered off into a light drizzle, and the sharp wind died down. The men were soaked, wet, cold, and as miserable as men can get. Their eyes burned, for there had been no sleep; and there would be none for two more nights. It was five o'clock. They had been waiting in that graveyard of tanks for three hours; waiting and raging inwardly at the ones responsible for the delay. They did not know that a combat-reconnaissance patrol had been sent out to gain information that in the end would make their attack less suicidal in nature. They waited, not knowing, and the patrol crept up the hill, through and behind the enemy. "Lieutenant Kendall Bailey McClure is a young man, much younger than his appearance would lead one to believe. 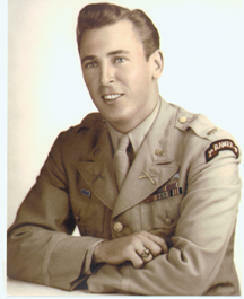 He has cool gray eyes, a receding line of thin, sandy hair, and when he smiles, dimples that any number of Army nurses have declared to be somewhat indecent. He is a young man who sings plaintive cowboy ballads to whomever will listen at any hour of the day or night; and if no one else will heed the mournful notes, he sings to himself. Lieutenant McClure is a young man who has been around, and he is from Texas." "They wanted a patrol," he said, "and boy, they got it! I was in Fox Company then, remember, and while we were still in the Forest they told me that I would take five men from my company, and Lieutenant Lomell would take five men from Dog Company, and go up on the hill to find out the best routes for attack, and if there were any mines, and all such stuff as that." "Remember about four o'clock that morning, after the column stopped just outside of the town? Somebody walked up and says, "Where's that Lieutenant from Fox that's going on patrol?" and I says kind of squeaky like. 'That's me!' So he says for me to get my men and come with him. About that time Lomell and his bunch walks up, and we take off together. Captain Slater had charge of operations, and we were supposed to find him in this C. P. they took us to." It was in a cellar there in town. Honest to God, you never saw anything like that cellar in all your life! Dealers everywhere! Big dealers, little dealers, medium sized dealers, all over the Goddam place. Couldn't stir 'em with a stick." Lieutenant McClure leaned back against a tall oak tree and closed his eyes. He grinned, remembering. "There was two rooms, little dealers in the little room, big dealers in the big room, and medium size in both of 'em. Little dealers had notebooks and things, and were busy as hell making notes and reports and all such as that. So we stepped over 'em, and crowded into the next room, with the big operators." "Have a seat! You couldn't even stand in that damn' cellar, much less sit down. So Cap'n Massney says, 'Come on, let's get to hell out of here, these bastards don't know what the score is, no wonder they can't take this damn' town!' So we squeezed back up the steps, out in the nice clean, stinking air and away from the dealers. Quite a relief! "Well, we took off down the street, and finally located Captain Slater in another cellar. He'd decided to set up the Ranger C. P. by itself. Couldn't blame him, after seeing that other one! He gave us the dope on what he wanted. He said both patrols ought to work through town, past the church, and watch out for the best routes to take for the attack. When we got to the foot of the hill, I was supposed to turn left and go about a hundred yards or so, and then try to get up the hill. Lomell and his bunch would turn right, and see what was out on that road that led around the foot of the hill. Combat and reconnaissance. Nobody knew just what Jerry had, or where* it was. There were supposed to be minefields, but he wasn't sure about that either. We had exactly one hour. After that, our own artillery was going to start laying in on the hill, to try to soften it up for us when we made the attack. If we didn't get back before then, it would be just too bad. Someone asked, "Wasn't it unusual for the Rangers to be going into a job with as little briefing as that?" "Sure it was," he answered, "but then, by God, this was an unusual job all the way 'round. Rush affair. We just had to have that hill, and everybody else had made a mess out of taking it, so there you were. "Well, we took off down the street, not knowing what was going to happen from one second to the next. We passed the house that was burning—remember it? I had my flashlight in my hip pocket, and somehow or other that damned thing worked around and started shining! Lomell said, 'Mac, for God's sake, put out that light!' I felt around, and pulled the thing out of my pocket, turned it off and then threw the sonofabitch as far as I could heave it. Never carried one in combat since then, either. Well, about fifteen seconds later they dropped three mortar shells in the street right where that light had been shining. We hit the dirt, and the shrapnel flew up and over our heads. Jesus, they were close! Those bastards sure were zeroed in on that town! "We went on down the street, just snoopin, and poopin', and about a block from the edge of town we came to an American outpost. We asked him if there was anything between him and the church, and he says that no, he's the last outpost, and what's in that last block he doesn't know. Says he doesn't think there's any Jerries left in town, though. So we go sneakin' on, and get just even with the church, right on the edge of town, and somebody hollers, 'Halt', real low like. But we just said 'To hell with him. These Goddam people don't even know where their "own outposts are!' And we went right on by him. "Well sir, we took that sunken road that runs in back of the church, and looked up that road to the right. Funny thing. You could just smell death up that way. We didn't know what was up that road, but we knew anyhow that if Lomell went to find out, him and his boys would never get back to tell about it. So I says, 'Come on, Lomell, we'll all go to the left!' So we all twelve of us went snoopin' and poopin' off to the left, sweating out the mines, and brother, I do mean sweating! We made it around the side of the hill, and then started up her. Got about halfway to the top, and then we heard some Jerries cleaning a heavy machine gun, it sounded like. So we laid out there, and, by God, they was all around us. "We laid there for fifteen or twenty minutes, just listening. You'd be surprised at how much you can learn with just your ears. Then it was about time we got back, if we didn't want to get caught in our own artillery, so we sneaked back down to the church, and out on the street again. "There was this same guy, hiding in the shadow of the church, and 'halt'. Then they opened fire on us. Yes sir, that was no American outpost. It was purely German! They started hollering then, and you should have seen us flying down that street. Like striped-assed gazeeles,* boy, in full flight! When we got back to the C. P. we were so damn' scared Captain Slater stuck cigarettes in our mouths, and then had to light 'em for us. We were shaking too bad to do it ourselves!" * Gazeele: probably the Texas equivalent of the ordinary American gazelle. "So you see," the Lieutenant concluded, "while you guys were sweating it out on the road, and probably calling us all kinds of names, we weren't having no pink tea, ourselves!" The long wait was over. The patrol had brought back vital information, and on that foundation a plan of attack could be built. At six o'clock the word came down the lines of numb, miserable men, "Get ready to move. We're going into the town." Once more they adjusted their packs and slung their rifles, and the column moved again at last. The cobbled streets were cluttered with dead, the machines of war and the men who operated them. A horrible, expectant silence brooded over the streets and pressed down upon the Rangers as they stumbled along past the now graying shapes of wrecked homes. Dog Company reached the burning building. It was nothing more than a chimney and some smoldering heaps of rubble; but parts of it, especially around the chimney, were still red hot, glowing with an unearthly light. They must pass between the house and the hill which rose, dark and threatening, it seemed, only a few hundred yards away. The men bent low and ran past the house as fast as they could under their heavy loads, for the eerie glow would silhouette them perfectly to any Germans who might have been watching from the hill. Everyone got safely past without mishap. In a few more minutes the company had reached the crumbling building assigned to it, and the men were groping their way into the cellar. They perched on piles of coal or wood, for six inches of water covered the concrete floor; but they were thankful for these moments of safety. Comfort was something remembered in the past. They sat there, thinking their thoughts, and dried the ammunition in their belts, and cleaned their rifles as well as they were able. At six forty-five the platoon leaders returned from a conference with the company commander. They had information of the plan of attack. It would be launched at seven-thirty — in forty-five minutes. Easy Company would lead, cleaning up the town (Armored outfits have been trying it for almost a week—but Easy Company will lead, cleaning up the town!). Fox Company would follow them through, to the left base of the hill, and Dog Company to the right. All three Companies would halt at the first phase line, a ditch bordering the open field surrounding the hill. For the second phase, Dog and Fox would launch the assault across the field and up the hill. They would take the hill, and hold it. "That field is supposed to be mined, so be careful. Watch out for snipers in town, too. Easy can probably take the damn' street, but this is such a rush job they might overlook one or two, so be on your guard. Keep your eyes open ..."
The field in front of the hill. Those few last minutes before the fight starts are always worse in some respects than the battle itself. You try to relax, but after the first few minutes you realize the absurdity of it. You light a small unit of "canned heat," and try to dry your gloves; you do a magnificent job of scorching them, but they stay warm for a little while. Your stomach has that sick, empty feeling—yours, and everyone else's. You experience a strange sensation of unreality, of sick detachment; you stand aloof from yourself, as it were, and watch yourself struggle with mounting fear. And the forty-five minutes pass, too quickly. You know that Easy Company has jumped off on the attack, for a terrific barrage of artillery has begun to fall in the town. All Hell seems to have broken loose. The house you are in is hit several times. No steel fragments come through the cement roof above you, but cold sweat breaks out on your forehead and hands. You want to be sick at your stomach, but there is no time. It is seven-thirty. You have to emerge from the safety of your flooded cellar and go out into that Hell of concussion and bursting shrapnel and soul shaking explosions. This is M-Minute of H-Hour, and you dart out the doorway into the street. You follow the man ahead, hugging the ruined walls of one house before making the short dash to the next one. The spine-shattering explosions have almost deafened you; you feel quite numb as you start around the corner of the house which is just past the street intersection. There is a sudden blinding roar. You are lifted a few feet in the air, and dropped again on to the frozen earth with a heavy thud. You black out for a few seconds that seem an eternity, and then you start forward again. That was as close as they can come without killing you. Around the corner of the building, Lieutenant Schelper, the man ahead of you, lies spread-eagled. His left cheek rests against the hard ground. He looks asleep, and at peace, and dead. Then his white lips begin to twitch ever so slightly. Concussion. You make the journey through Bergstein with Death holding one hand all the while. Paradoxically, you are no longer afraid of dying. After you passed the man without a leg (he was conscious, and screamed at you to get a medic), you passed the point at which the prospect of death could frighten you. If there was a thought of yourself now, it was a fervent hope that the end, when it came, would be quick. Anything would be better than to have to lie in this ghastly, heaving street, like the man with the raw, shredded stump, and bleed to death. You dart on . . . from wall to crater and back to shattered wall again; you see a world of little things that mean nothing at the moment and which you will later recall as disconnected details of a horrible, shell-torn nightmare dimly remembered . . . the dozen or so German soldiers running past you in the opposite direction, helmet-less, and with their hands behind their heads . . . you marvel that Germans must be immune to their own shrapnel . . . the dirty loaf of bread lying in a new shell hole . . . the piece of shrapnel that comes whirring viciously at you; it tears your pack almost off your back, and spins you around like a top . . . the figures and faces of men you know lying in the street and along the destroyed houses . . . You move furiously past all these things in a dream — a dream that places you suddenly at the massive stone church, with three dead Germans sprawled obscenely on the steps; into the walled churchyard, some of whose marble tombstones and crosses are still in position and completely intact. You go through the stone archway in the battered wall, cut across the road, and leap into the ditch near Sergeant Koenig. You have come a few hundred yards through a barrage no man has any right to live through. Others have shaken off Death's icy hand, too; for they are flying into the ditch beside you and spreading out to your right. You wait for the order to attack up the hill, and as you wait, your intelligence begins to return. There are many little scraps of Bergstein in your mind. They do not fit neatly together to form a lucid picture, but you do not worry about that now. There is the hill yet. Hill 400 rises starkly, a pine-covered ice-cream cone, on the other side of the field at whose edge you are now crouching. A few Germans are firing at you, rather ineffectually. The assault is going to be a tough proposition, but a wonderful, dangerous feeling of invincibility is stealing over you. Anyone who came through that barrage should he able to lake in his stride anything the Germans might throw at him! "Keep firing as you walk—and don't stop walking, no matter what happens. If you let them pin you down to the ground, you're done for. Keep moving, and keep firing, and watch out for those mines while you're going across the field . . ."
The signal has come down, and there is a sudden, terrific volley of fire from your ditch. You reload and come out firing. The first burst has been effective; Jerry has buttoned up in his holes and pillboxes, and is returning your tire with only scattered bursts. You start across the field at a trot, shooting at every step, and yelling like a madman. Kmitt goes down, shot in the stomach; you do not stop, for Kinmonth, the medic, is already with him. You go on. If there are mines, you neither see them nor step on them. You have crossed the field and are at the foot of the steep hill. The black-helmeted Nazi who has been sniping at you all the way across comes up out of his heavy log shelter with his hands high, shouting, "Kamerad, Kam ..." Pat McCrone turns a quick stream of tommy-gun fire on him, and he slumps back down into the dug-out, split almost in half. You go on, up the steep hill. The artillery in the town has died out now, and only the sharp staccato of rifles and automatic weapons bursts in the air. The feeling of invincibility persists. This is a child's game. The damned Germans are running from you. The attack has followed no pattern they have ever seen before (they, or you, either! ); if the Generals who write the textbooks on tactics could have seen that assault, they would have died of shock. It is a new pattern you have made this morning—a single wave of shooting, screaming Rangers—and the Jerries have been unable to deal with it. They run, or try to surrender. But you have scores to settle from Vossenack, and fire fast. On the other side of the hill, Captain Massney walks up to a pillbox, pushes the door open with his massive foot, and tosses in a grenade. The Germans—twelve of them—come out with their hands up, and are sent down the hill into your town. Your town, and now your hill. It has been as easy as that. 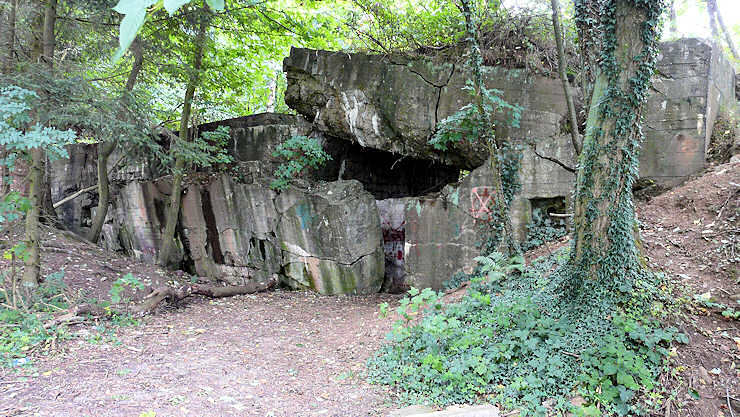 Pillbox #320a at the northern base of the hill. "No, there was no way we could possibly have known; and if we could have foreseen, we still would have had to take and hold the hill, no matter what the cost to us in lives and agony. The cost, though . . . it was so high a price to pay for that miserable little hill of the Roerland . . ."
Not many of you have a chance to dig in. You spend a few minutes walking around the top of the rocky, pine-clad hill, feeling sure of yourselves, and altogether full of power. You walk in the sunlight; you look at one another; you remember the misery of a few hours before, and exchange laughs of sheer exultation at the mere thought of being alive. You select the spots for your foxholes. The digging is a cruel job—this hill is almost solid rock—and progress is slow. If Doc Block could see you now, he would instantly perceive that you are in a condition of shock from the hideous barrage you have run through. If you were normal, every man would realize that this sunshine, so warm and bright, furnishes perfect conditions for observation, and that even now, you are being fixed in the sights of hundreds of German guns and mortars across the river. You would be digging with frantic haste against the barrage you would know was on the way to you. But the sun warms you without warning you. The rocks are hard, and heavy; the pine roots are thick, and tough as steel cables. You peck away at the earth, glowing with the success of your assault and with the realization of your invincibility. Then it happens. You hear the first ones shrieking in, and you hit the ground. You hear no more coming in after that, for the thunder of the first ones drowns out the approach of the others. It is a vicious circle without end. A dozen shells are hitting the hill from three directions every time you draw a breath. The hill is in convulsions, and seems to be bursting apart at its rocky seams. Trees, limbs, and rocks are mixed with the dirt and the flying steel fragments. The stench of cordite is everywhere. You get up to try to run for the partial protection of that boulder sticking up out of the ground, but are knocked down a dozen times before you can cover the twenty-five yards. By some miracle it is concussion each time, instead of steel, though your overcoat is ripped in several places. Around you, all over the hill, men are dying. This is the end, you think, and hope again that death, when it comes, will be swift and merciful, as it was for Trout and McCrone and Lewis and Branley. They lie close together, a few yards away, and never knew what hit them. You lie on your belly beside the boulder, and dig; your shovel bites easily into the soft rock, and two inch roots snap easily as rotten thread. Your hole is half-finished as the barrage begins to abate. You go on digging, though your arms are numb and your hands raw. You dig, and watch the bottom of the hill, for you know that a counterattack will come now. The Germans evidently think no one could be left alive; or, if alive, in condition to resist. But the damned Germans learn what it is to contend with Rangers. You fire at the gray-green uniforms, fast and accurate shots and they are driven off before they have made a good start. Now, as though in revenge, the barrage is resumed. By this time the holes are getting deeper, and casualties are lighter. Men are dying still, though, and you wonder desperately how many of you there can be left with so many killed and wounded. At 12:30 your question is answered. Seventeen are left from the sixty-five of Dog Company. Fox has only fifteen. A total of thirty-two men remain out of a hundred and thirty. The day of attrition wears on. At four o'clock that afternoon only twenty-five Rangers are left on the hill. Attack follows barrage, and barrage follows futile attack. You stay in your hole only because you are a Ranger. Then the night closes in, and though with every long second that passes a shell is bursting on the hill, the fierce intensity has slackened. "That was the longest night we ever spent; fifteen hours of weird, black nightmare; of flares streaming their hellish glow on the tortured hillside; of mortar shells crumping in a few yards away, beating the breath from our lungs, leaving us gasping and dazed; fifteen hours of tense straining to detect the approach of the Hun, who did not come often, for to move on the hill that night meant death, swift and violent. Then the red dawn came again for us; but we were tired, and dulled with sleeplessness and shock. We were so few . . . so very few . . ."
The Duke came striding up over the top of the hill, calm and confident as always. It was the morning of the second day, and he had come from the thick walled church to survey the scene of the operation of which he was in charge. His presence, the mere sight of his familiar figure standing there gazing down at the twisted, rushing Roer River, was an inspiration; morale began to creep up to a more normal level. This was a respite. American dive bombers wheeled and screamed overhead, blasting German positions. Dog Company watched them, and kept one eye on the gathering clouds, which they knew would soon drive the planes back to their bases. The shelling would be resumed then, they knew. Meanwhile, one platoon from Easy Company had come up the hill to fill the holes left empty by the wounded and the dead of Dog and Fox. With these reinforcements, the next attack should be easy to throw back. 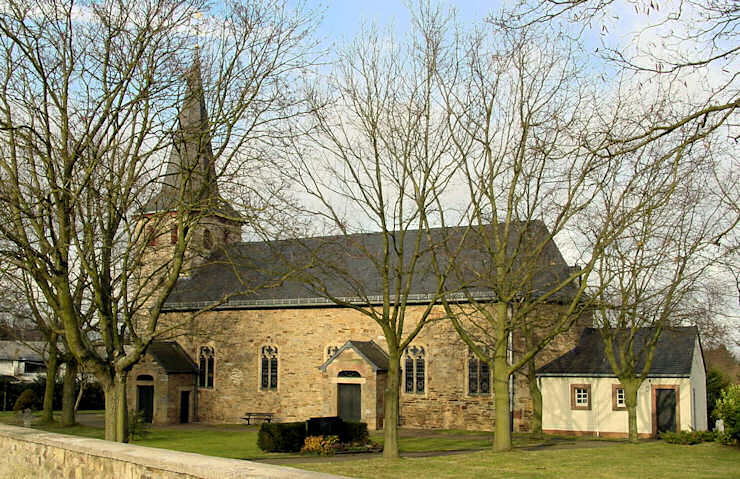 The village of Zerkall from which the Germans counterattacked. The first one came at 1130, the strongest yet, with hordes of Nazis swarming up the hill from three directions. So strong was it that the Ranger positions, though reinforced, were on the verge of being overrun. 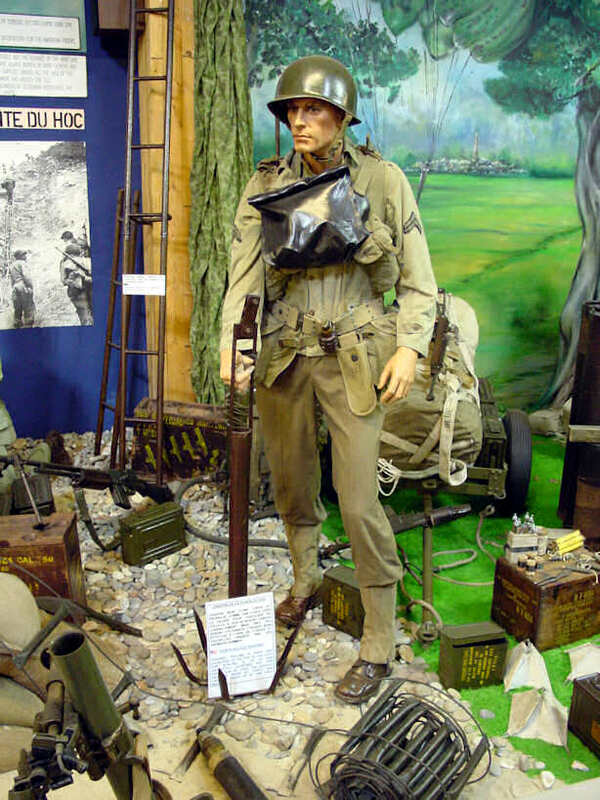 At that critical moment, Sergeant Secor, his own weapon useless, seized two captured German automatic weapons, and, holding one under each arm, turned twin streams of devastating fire upon the advancing enemy. The attack was broken. They tried again, at 1630, in yet stronger force, and again they were turned back. After that, the Germans did not try again; and the dreadful artillery and mortar shells, as though acknowledging defeat, dwindled away to harassing fire, with no more than one or two exploding each second. Shortly after midnight, the Rangers were relieved from the situation by Infantry, and the fifteen men of Dog Company stumbled blindly down the hill, through the town and again into the flooded cellar they had left with fifty others, less than forty eight hours before. A long march to waiting trucks still lay ahead of them, but the battle of Bergstein was over. 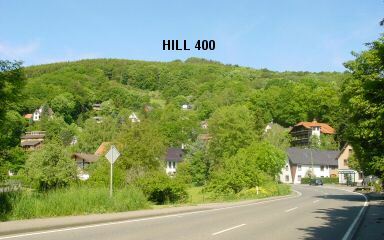 Hill 400 was finished. No Ranger was interested in knowing that night that he had been further into Germany than any other Allied troops had yet gone. They had been three nights without sleep, and that was what they wanted now. At four o'clock they saw again their log shelters in the Huertgen Forest. They rolled themselves in their blankets and lay down to sleep at last. It was snowing again in the Forest. The wind sighed heavily through the snow-blanketed pine branches, pushed its way in through cracks in the rude shelters, and jostled the smoky flames of the crude gasoline lamps. Flickering shadows played over the drawn, dirty faces of the Company's fifteen men. They slept, and when outgoing shells rustled overhead, tired bodies jerked and twitched in automatic nervous reaction. In the three cabins (two days ago it had been twelve) they huddled closely together, and the uneasy night passed quickly. Excerpted from "D for Dog" The Story of a Ranger Company book by Alfred E. Baer Jr.